No matter where you live, the tap water is sure to contain some chemicals you don’t want to drink. For instance, we at Environmental Working Group recently reviewed the water quality tests of 201 big water utilities that serve 100 million Americans. As our new report shows, every single one of them was polluted with unwanted chemicals called trihalomethanes, which are linked to bladder cancer and other serious disorders. One member of this family is chloroform, which the U.S. government considers a probable human carcinogen. Trihalomethanes form when chlorine, a disinfectant added to the water to kill dangerous bacteria, reacts with rotting organic matter such as runoff from farms, sewage or even dead leaves and insects. The Environmental Protection Agency regulates this chemical family, but we think the rules should be tighter. If you want to get rid of trihalomethanes and other chemicals that linger in your tap water, you can buy a water filter. EWG’s new Water Filter Buying Guide lists 137 of the most affordable and effective water filters. To pick the right one, you need to know what chemicals are in your water. The answer is not all that simple because everybody’s drinking water contains different mixes of contaminants. You’ll find many of the answers in the water quality report published annually by your water utility. This is an important resource that consumers often overlook. It is usually called a Consumer Confidence Report but may also be titled Water Quality Report, or Drinking Water Quality. The law requires that the utility provide this report to all its customers by July 1. You should have received one in the mail. If you accidentally threw it out, you can request one, or you may find a digital copy on the utility’s website. Parts per billion (ppb) or parts per million (ppm) – These are measures of the concentration of a chemical. 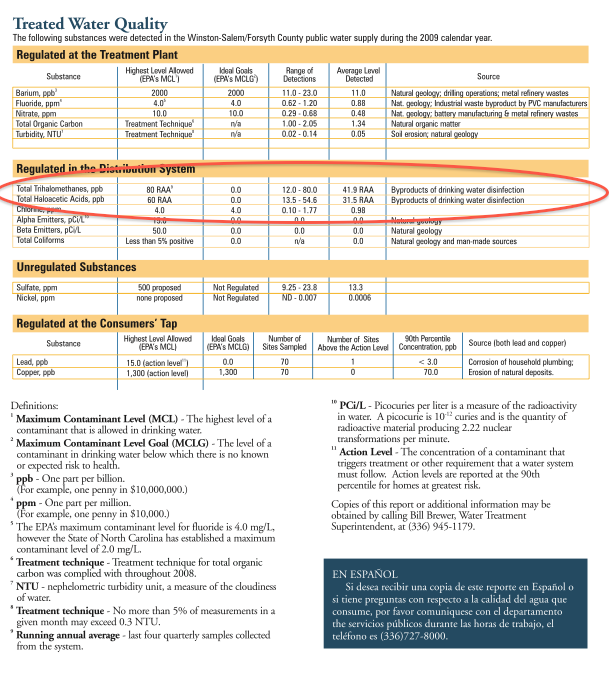 Maximum Contaminant Level (MCL) – This is the legal maximum set by federal law and EPA regulations. EWG believes that many of EPA’s regulations, based on a compromise between health risk and costs, are too lenient. Moreover, there are countless other contaminants that are not even regulated by EPA. When you read your utility’s water quality report, pay close attention to readings higher than the Maximum Contaminant Level, or MCL. These violate federal law and regulations. They can be dangerous to human health. Take a particularly careful look at the measurements for arsenic, lead and trihalomethanes. Even if they don’t exceed the regulatory cap, they can be linked to serious health problems. You should consider a filter that can reduce the concentration of these chemicals in the water you drink. If you find that your tap water contains unwanted contaminants, you may think that the answer is to drink bottled water. The truth is, bottled water may be no better than tap water. It’s more expensive and does significant harm to the environment.. If you are on a tight budget, filters using activated carbon are your best bet. They remove lead, chlorine and trihalomethanes and many other contaminants at a modest price. If your water is highly polluted and you can afford a more expensive, more comprehensive filtration system, you may want to consider reverse osmosis combined with activated carbon. If you make sure you get one with a superior activated carbon pre-filter, this technology can filter out everything that activated carbon catches and reduces other contaminants, including arsenic, hexavalent chromium, nitrates and perchlorate. Reverse osmosis filters are typically installed under the sink and integrated into your plumbing. If you are buying a strictly carbon filter, you have a lot more choices. For ease of use and affordability, pitcher filters are a good pick. But if constant refilling bothers you, try a faucet-mounted filter. The best filters tend to be those that sit on your countertop or under the sink, so if you can modify your plumbing and can afford a higher priced filter, these may be your best bet. You’ll find detailed information about all these water filter technologies here, in EWG’s Water Filter Buying Guide. There’s no one-size-fits-all when it comes to cleaning up tap water, so to get the best results for your money, do your research. And remember: all types and styles of water filters require regular maintenance to keep working!